Once under the Banbury Lane bridge there is a farm on the left which by the array of sounds and smells must have a menagerie of animals to rival Dudley Zoo. The canal curves, leaves the railway for a short time and Bugbrooke starts to appear on the bridge numbers. The railway can’t be shaken off though and reappears with just a slither of land between it and the canal. The towpath is now narrow, uneven and practically disappears into the canal in places. When the path improves it’s an indication that we are approaching Bugbrooke, its marina and the Wharf pub at bridge 36. After a short cutting to Elliots Bridge the towpath deteriorates again but isn’t too bad as the bank has been reinforced. After Heyford Fields Marina, just before bridge 34 and looking as smart as when opened in 2008, the canal straightens, the scene is bucolic and the only jarring sound is the buzzing of electricity pylons. Around bridge 33 there are a few boats gathered at Furnace Wharf and the Olde Swan is within walking distance. Further on the canal is carried on an embankment way above the surrounding country before curving in front of an attractive white house with two working boats moored in front. There’s a line of boats moored just past Spiderworx Coach painting, but look to the right and the M1 has come into view. A portent of things to come. Next to bridge 27 is the former Flore Lane Wharf, now a striking residence and past the bridge are further attractively converted canalside buildings. Quickly you get to Stowe Hill Workshop, Rugby Boat Sales and the Narrowboat pub as you approach Weedon Bec. Weedon’s greatest claim to historical fame lies behind the marina where there are the listed remains of a Napoleonic ordnance depot complete with the remnants of a branch canal that delivered the required gunpowder. This establishment was substantial, covering over 150 acres, and saw active service into the 1960s. 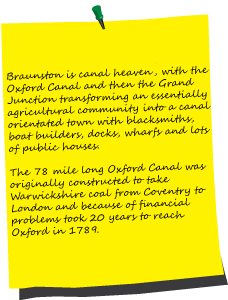 The canal from Weedon to Braunston is also historically important as it was the first part of the Grand Junction to open in 1796. After the Heart of England pub, the canal plays cat and mouse with the railway and meanders to bridge 22 where you again glimpse the M1. After bridge 20 there is a juxtaposition of birdsong heaven from the woods on the left and motorway traffic hell on the right. The motorway hard shoulder gets within touching distance and you are squashed between it and the canal. For over a mile three forms of transport from different centuries (all going from London to Birmingham) now run in parallel. Just before the Buckby flight of seven locks (constructed 1793-6), there is Whilton Marina. The canal sweeps away from the motorway under the railway and, although still apparent, the traffic noise has diminished by the time you reach an imposing house nestled behind weeping willows and some attractive if eccentric cottages before Buckby Top Lock, where you pass through the horse tunnel and are rewarded by the New Inn on the other side of the A5. Moving on from the top lock, where a branch to Daventry was originally planned but never built, there’s a line of boats to Norton Junction where the Leicester Line links the canal system to the rivers Soar and Trent. Crossing to the other side of both canals you reach a small cutting and realise how quiet the canal has become as it enters a very rural phase and the towpath becomes wider and more even. Not a lot happens for a while until another cutting and the east portal of the 2042 yd, 16ft 6ins wide, three brick lined Braunston Tunnel appears. There’s no towpath, and the leggers who charged 1s a boat have retired, so take the bridleway over the top where there are reassuring ventilation shafts to confirm that you are going in the right direction. After the tunnel there are six locks leading to Braunston, where you'll find the pumping house that had a Boulton and Watt steam engine to return water to the top lock. Then at the Braunston Turn you go under the magnificent twin Horseley bridges put in place a year after the Oxford Canal was straightened to form this new junction. After noting where the Oxford Canal used to meander to Braunston you might enter a time warp passing a boat covered with images from the 70s and a dismantled railway which has attracted the attention of Pink Floyd devotees, the cutting between bridges 97 and 98 then leads you to what might be a hippy shanty town with a collection of both working and residential boats. Realising its strategic importance, the owners of the Oxford Canal charged high tolls for the journey from here to Napton which made up somewhat for the loss of trade on the rest of their canal. 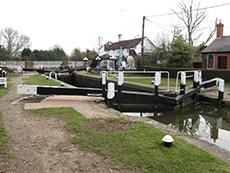 The original finishing point of the Oxford Canal is where the marina entrance is now. The old Toll House was built in 1796 and on the opposite side is the clay pit from which the tunnel bricks were made. ‘Bec’ comes from the time when Weedon was owned by a French Abbey.